Though she's not Edna now (Brad was never going to allow that), but Annie Maureen– named for two of our favorite aunts. The name Annie means grace, which, as I reflect on the past (almost) two weeks she's been out in the world, suddenly seems so fitting. So perfect. I feel as if grace has been a soft blanket that has covered my family and I as we prepared for Annie's arrival and welcomed her into the fold. Though I hadn't realized it in the midst of my pregnancy, accepting the grace and gracious acts of others was a lesson I've been long overdue for. 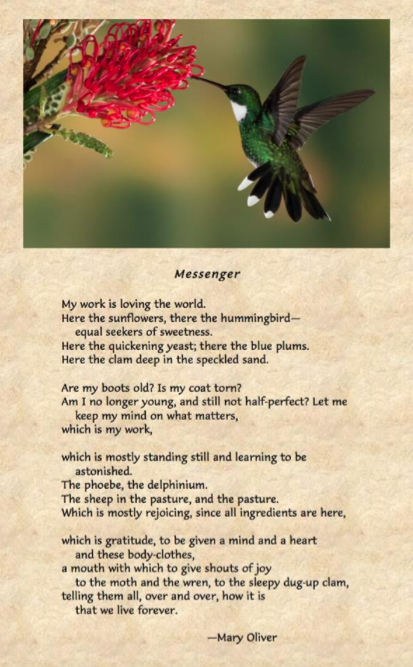 I much prefer to fly under the radar, to be self-sufficient, to not cause a fuss. 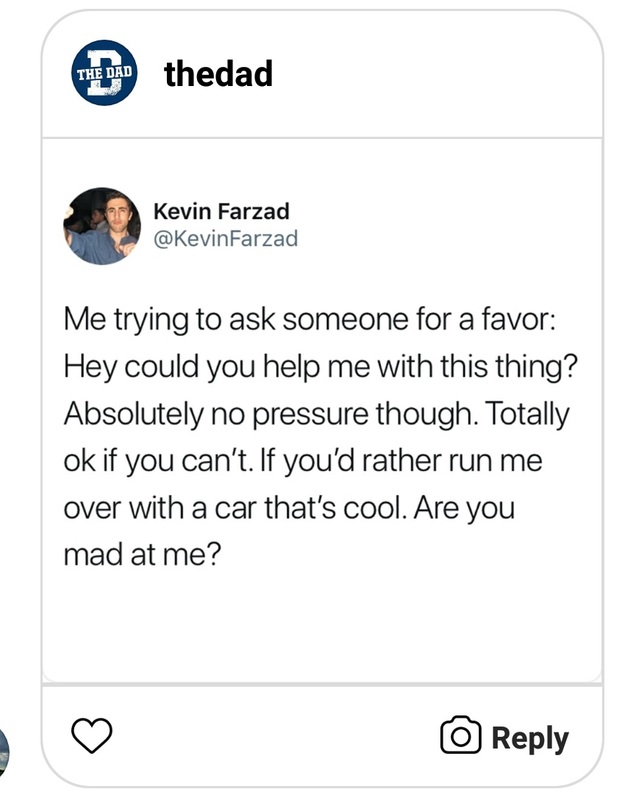 I don't want people to have to go out of their way for me. I'd much prefer to cede space and time to others. These are all qualities I've always assumed would make me more likable, or at least fairly inoffensive. As evidenced by the meme my sister shared, this might be a family trait. But pregnancy and labor and starting over as a new mom again with two kids at home has forced me to accept the help I'd long associated with feeling like a nuisance. And I've been surprised to discover, that instead of making me feel overly needy or annoying or helpless, that it's softened me. It's filled me with this enormous and robust feeling of gratitude toward others– my family and friends, of course, but also near strangers. Major life revelations seem to pop up at the strangest moments. 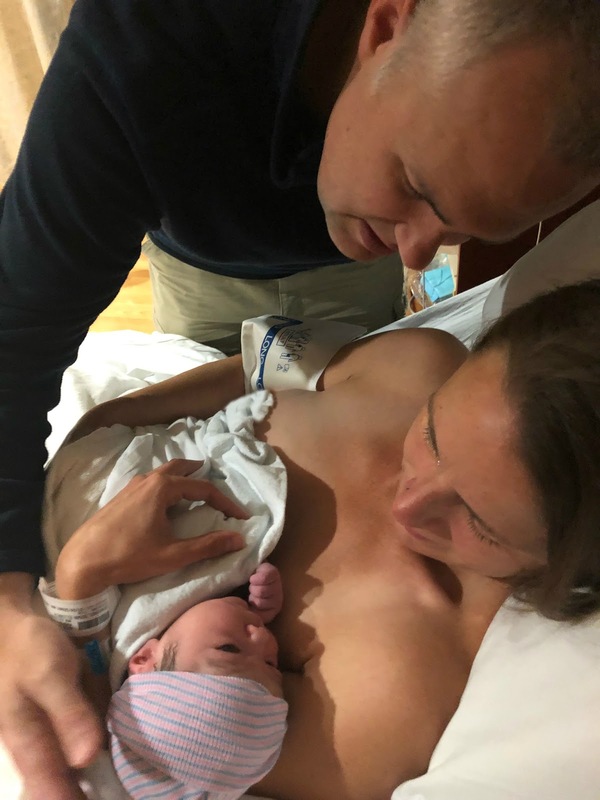 I recognized the significance of gratitude (and also humility) while sitting on the toilet in my hospital room shortly after delivering Annie. It was probably 5 or 5:30 in the morning. Like Lily and Jovie, Annie decided to make her appearance in the stillness of a late night. I'd spent an hour or more marveling at my little girl– her head full of silky, dark hair. Her delicate fingers and wide indigo eyes. It was time to move from the delivery room to maternity, but first I needed to get up and use the bathroom. I apologized to Kristen, the nurse, for making a mess. And, as she'd been repeating all night in her soft-spoken voice– perfect for midnight laboring, she told me that I didn't need to be sorry. I shuffled to the bathroom and sat down. Kristen had turned on the water in the sink to help "inspire" my bladder to do its job. Unfortunately, my bladder was not inspired. While we waited, Kristen grabbed some wipes and knelt down on the bathroom floor to wipe the blood off my feet and legs. I was too exhausted and weak to tell her I could clean my own feet off (nevermind that I wouldn't have been able to). Instead, in this most vulnerable of places I sat boiling over with hormones and elation and weariness and watched as Kristen washed my feet. She was so quiet and gentle. Showing the same tenderness toward my body that I'd just shown Annie to hers. What was supposed to be embarrassment was washed away with wave after wave of gratitude. And actually, love, I think for this nurse's simple grace. You never forget the day you push your children into the world. The moment you first rest your eyes on them, searching their face for recognition only to realize you already know them- your souls already twined together. Forever tied to Annie's birth will be Nurse Kristen kneeling on the bathroom floor, cleaning me while I sat on the toilet. Teaching me about gratitude and humility. Reminding me that vulnerability need not be a weakness, but the taproot of our shared humanity. I've spent a lot of the past couple weeks feeling thankful. Thinking about all the people who've bolstered my family in big and small ways over the past couple months. My sister Laura for helping me pack up our rental and for showing up on moving day with my two strapping nephews to help Brad move all the boxes and furniture I was unable to. Ditto for my brother in law and best friend, Becky. For my sister Sarah for taking care of Lily and Jovie while we transitioned from one house to the other, making sure to show them the best weekend ever. The neighborhood social committee for including the girls and I on a tubing trip down the Shenandoah River despite the fact that I was nine months pregnant and maybe had no business trying to squeeze into an inner tube for a float down the river. For making sure I didn't get stuck, for laughing along with me when I attempted hoisting maneuvers in said tube, for insisting on carrying my tube for me. For their older daughters who took my little daughters under their wings. For giving me an afternoon of buoyancy and relaxation and silliness at the tail end of a long, hot pregnancy. For my neighbor, Star, who insisted all babies need to be honored whether it's the first or the third, and who gathered a group of ladies from the neighborhood for celebratory pedicures. For Rosemary who shared her home so we could eat post-pedicure "Baby Edna" cake while cooing over adorable baby gear and hazing the poor high school-aged neighbor boy who stopped by looking for his buddy. For Rosemary again who took my girls home from the pool sopping wet without a moments hesitation when I had to make an emergency trip to Labor & Delivery at 36 weeks for unexplained bleeding. For Janna who was ready to do the same. For both women who sat me down that same day and asked pointedly what my plan was for the girls when I did go into labor. Who insisted I add their names to the list of people I call for help. Who we did call for help when the big day arrived. For Becky, who, after a long day of work, arrived at my house at 9:30 at night July 24 to watch the girls so Brad and I could go to the hospital. Who woke up at the crack of dawn ready to care for two over-eager little girls and did it all over again the next night. Earlier in the week, when I asked if she'd be willing to come over when the baby arrived she said "yes" without a moment's hesitation. For my sisters Jen and Laura, who showed up in the delivery room in the middle of the night to giggle with me and hold my hand and rub my back as we waited for Annie. For Amy who invited both girls over to play so that I could have a break. Who brought cake to celebrate Annie's "birth day." For neighbors who have brought meals and treats and beautiful handmade blankets– wrapping Annie and the rest of the family in kindness. For Brad's parents who drove down from the Poconos to meet Annie and drove back up to the Poconos with the girls to give us breathing room as we embark again on newborndom for the first time in more than six years. It's overwhelming to look at the scope of all the generosity people have shared with us. I struggle with guilt- that we're not deserving of it. That there are other people who need the help more than we do. That I haven't pulled my weight enough in my family or in this community to warrant all of it. I have to tell myself that just as all the phases we'll experience with Annie- the up-all-night stage and the teething stage and the crawling stage and the walking stage and the Terrible Twos and Threenagerdom, etc.- that our whole life is filled with seasons. In some of them- like the one we're in now– we'll be the ones being carried. In others, we'll be the ones doing the carrying. That it all balances in the end. 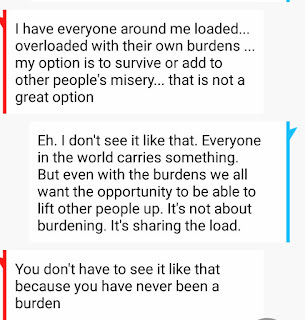 I told Laura that I feel like a burden these days. And that I've always felt kind of emotionally burdensome. She, of course, would not hear of it. That is a conversation for another day. 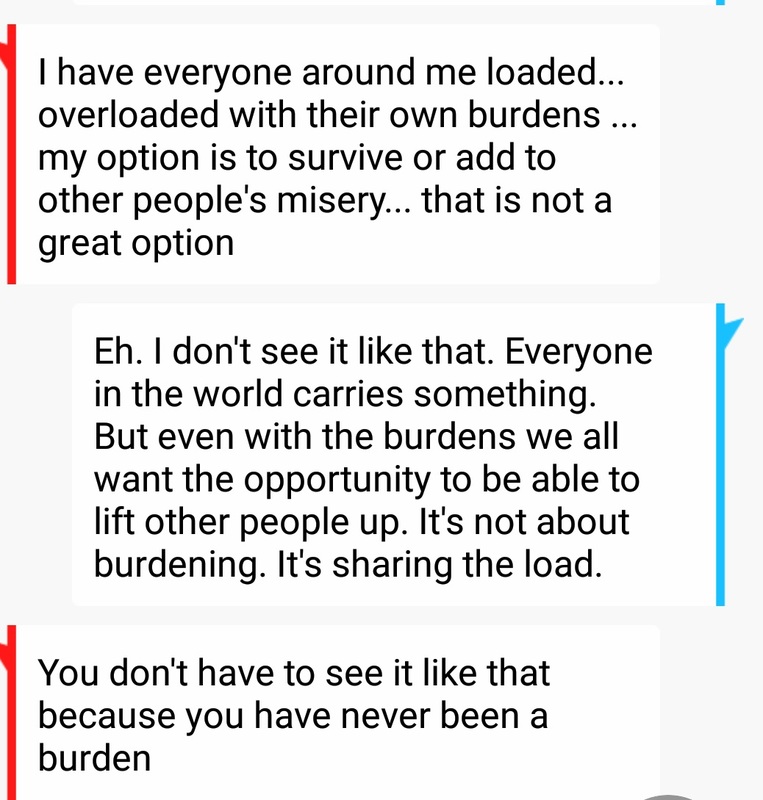 If the last couple months have taught me anything, it's that we're all going to feel like burdens at some point in our lives. Humans weren't meant to be self-sufficient. If that were the case, we'd all be more like wolverines or badgers. Happy to live out our lives in the blissful solitude of our own little burrows. Viciously attacking any interlopers. (I mean sure, I have days where I want to go in full-on badger mode- summer at home with a pair of elementary-school aged children who are simultaneously always bored and always hungry has kind of fueled my hunt for solitude in recent weeks). But for the most part, we crave community and togetherness. And I think that's a direct result of our need for each other- for food, protection, sharing resources and simple companionship. We need each other to bear witness to the happenings of our lives. And while being a burden isn't a great feeling, it's probably also necessary for developing empathy. Had Laura or I or anyone else never had to rely on the kindness and generosity of others to make it through a moment or a day or a season of life, I think we might not be as quick to extend a hand to others when they're facing their own trials. It helps to have tasted what it's like to need- even if it's temporary. And it inspires us to pay it forward when we have the chance and the means to do so. 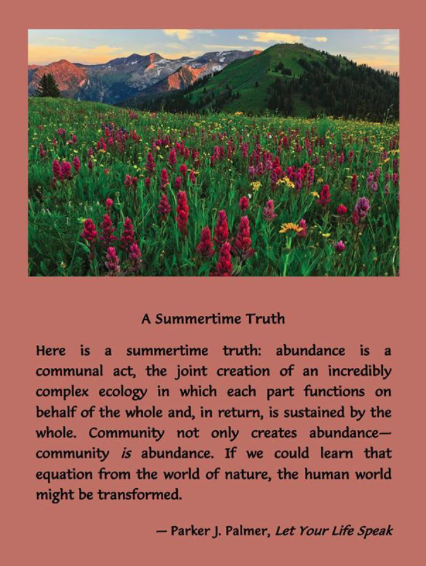 "Abundance is a communal act, the joint creation of an incredibly complex ecology in which each part functions on behalf of the whole and, in return, is sustained by the whole." Finally, and maybe this is just to soothe my own ego and sense of guilt, but I think getting the opportunity to help someone else is a gift. Whether it's a small act of kindness or a grand gesture, we do more to serve ourselves when we serve others. See, Annie has already taught me so much in her short life. There are two more people I need to express gratitude toward. The first is Brad. Years ago- probably not too long after we'd had Jovie- Brad had expressed doubt about wanting to have a third child. For all the reasonable reasons a father of two would have about not wanting to add to the brood. Our house wasn't big enough, our cars weren't big enough, our budget wasn't big enough. Our physical and emotional resources were doing just fine to accommodate the two we had. Why stretch them more? I heard him. And understood his pragmatism on the one level. But I'm not one level deep. I grew up in a big family. I'd always envisioned a little extra chaos in my life, not the orderly sensibility that came with being a family of four. I spent years mourning the third baby I thought I'd never have. It took Brad awhile to come around to my way of seeing things (if he came around at all or just gave up or gave in. 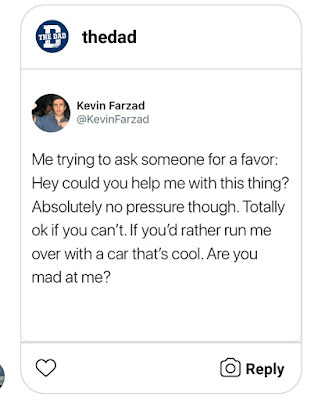 I can wear people down). But he did. He's joined me in my elation and infatuation with this new little person. The gratitude I feel for being mothered one more time is hard to express. It wasn't just about having on more baby, but feeling as if my vision for my family has been fully realized. That we are whole now in a way I didn't quite feel we were before. I have this profound sense of peace. As if this part of my life is suddenly ordered even as it's been totally blown up. Annie is a gift Brad has given me and given us and I'm so grateful for that. And last, I'm grateful to Annie for being here. For existing at all. For being at once a blend of Lily and Jovie and also wholly herself. For being my missing piece. I'm trying to savor all the moments of her days. The ridiculous squeak she makes when she hiccups. How she nuzzles her head against my cheek. The soft folds of her elbows and knees. The dimples that appear when she happens upon a smile. Since having her, I feel like the days yawn long without having accomplished much of anything aside from feeding, changing and gazing at her. It felt as if I'd been going at a break-neck pace for months and now all the sudden she's pulled back the reins and all I'm left to do is sit back and be awestruck by creation. Which is all the work I need to do for now I think.